This course is designed to introduce engineers and technicians to the fundamentals of Sysmac motion. The course discusses simple motion types (Position, Speed and Torque) and how to use Sysmac and the PLCopen library for motion to achieve this. The course is primarily hands-on using dedicated training equipment incorporating our NJ Sysmac controller and 1S Servo drive and motor. An explanation of motion types (Linear and rotary). An explanation of control types (Position, Speed and Torque control). Discussion of the types of hardware axes in Sysmac (Servo, Encoder and Pulse). Explanation of deterministic motion over EtherCAT. Configuration of the hardware axis (servo). Configuration and use of the Sysmac axis object for rotary and linear motion types. Practical hands on experience of the simple motion commands. Enabling and homing an axis. Single axis motion (Position, Velocity and Torque control). Detecting EtherCAT and Motion errors, and how to handle them. 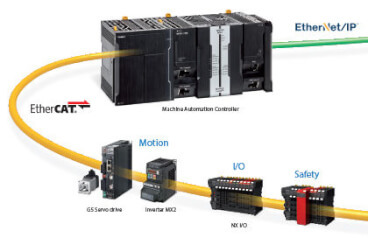 Servo safety principles – Wired and FSoE (Safety over EtherCAT). The primary objective of the course is to provide a comprehensive introduction to Omron Sysmac motion, for singular axis motion.